Only roughly 2% of Istanbul’s geographical area is green space. One tiny park in the center of Istanbul, Gezi Parkı, became at risk of being razed at the order of Prime Minister Erdoğan. A small number of protesters began a sit-in, occupy movement-style. They were gassed early-morning a week ago – leading to larger and larger protests w/ thousands upon thousands of people streaming towards the city center from the European and Asian sides of the city. The sheer numbers of people walking across the bridges from the Asian side to the European side of Istanbul over the Bosporus strait were staggering. “one tree fell, one nation rose!” And indeed, it appears this has happened, albeit perhaps for slightly more than 50% of the population. Turkey is split fairly evenly as I understand it between secularists & more conservative practitioners of Islam. Responses to these peaceful protests have been stunningly brutal on the part of the police who have used tear gas and pepper gas and water cannons with abandon. Our friends have been gassed and at times the gas has so saturated the air across the city that our friends have had to flee their apartments because they could not breathe. We have watched a video of police brutality on M.’s Home street – where we can see the family building which he grew up in and which is still part of the family. Can you imagine watching a revolution take place on your home street? There were pools of blood on the street – it was very disturbing. There are many light moments though, that I have watched on my iPad – videos highlighting the amazing creativity and humor of Turks in the face of such a difficult situation. One of my favorite graffiti lines said “please send more pepper gas – it’s good for the complexion.” Of course, after Prime Minister Erdoğan Referred to the protesters as çapulcular – Which can be translated as bombs, looters, rioters, troublemakers, etc. – The people have taken back the word and made it into their own. Slogans such as “I am çapuling every day” or “I çapul, Therefore I am” are commonly seen in graffiti around the city now. Tunceli, Diyarbakır, Rize, İzmir & Ankara Among many more. 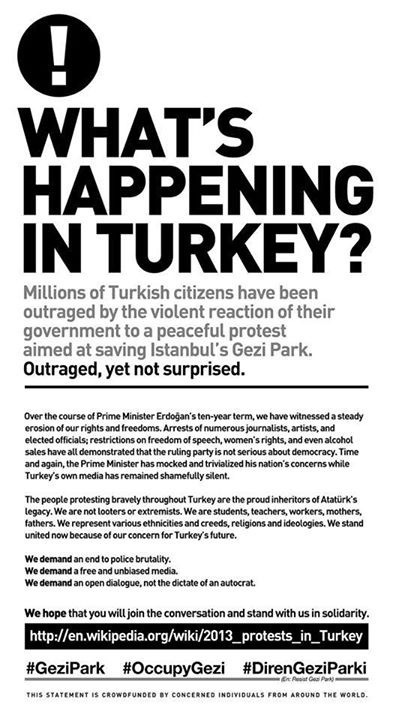 We hear that almost all of the 81 provinces in Turkey are experiencing protest – not mostly nonviolent protest. It saddens us that the United States television media especially seems to focus only on Istanbul – although it’s a bit better today. This entry was posted in On writing about my life with the Karagöz puppets, Turkish Controversies, Visits from the Karagöz puppets and tagged #direntürkiye, #occupyturkey, Çapulcular, çapulcu, çapuling, demonatration, gezi Parkı, protest, Recep Tayyip Erdoğan, Turkey. Bookmark the permalink. 9 Responses to The Karagöz puppets are çapuling from bed rest! So very well summarized, and roguishly written, as the protest itself, though deeply serious, is delightfully airy, and about air! Power to the people!! Reblogged this on Liz Cameron. Unbiased news is impossible to come by. At the best of times. We’re getting links by Facebook and keeping an eye on the BBC and Hurriyet. We can see what is happening on the streets locally.